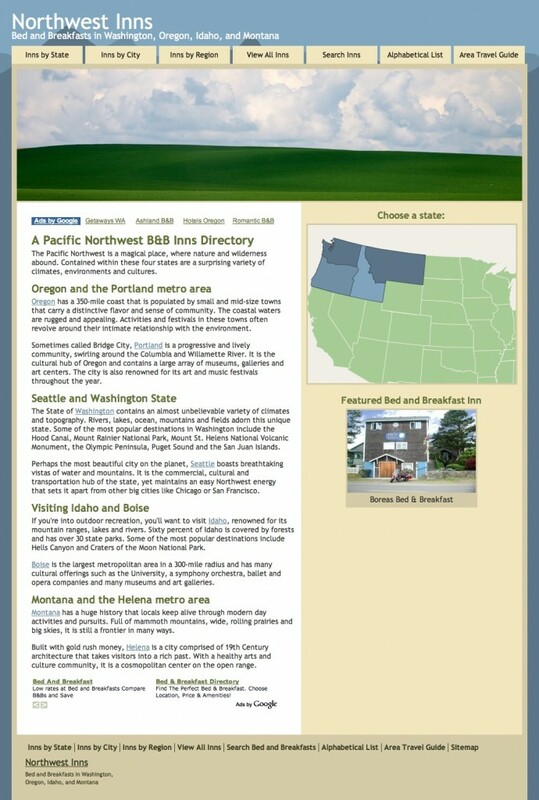 Northwest Inns: A New Directory Site - InsideOut Solutions, Inc.
About four months ago, the brilliant guys in our web department launched Northwest Inns, a guide to bed and breakfasts in Washington, Oregon, Montana and Idaho. The site was created as an experiment in SEO (Search Engine Optimization) as well as a place where we could list our current promotional clients to further their presence on the web through link-building. Northwest Inns is now becoming an important page on the web. The massive amount of content we have included on the site about our inns and the Northwest area is starting to pay off! Northwest Inns now has a page rank of 4, making it an authority site! This site is designed in PHP, (or Hypertext preprocesser, if you want to get confusing). It is a popular and growing development language, open source (which means it is free and available for modification by different web developers, like our Jack) and uses HTML embedded scripting language to create dynamic web pages. This is the content management language system we use to create our State Bed and Breakfast Association sites, such as the Accredited Inns and Bed and Breakfasts of Florida. So, if you are looking for a Northwest Lodging, look no further! InsideOut has your online vacation research covered again!